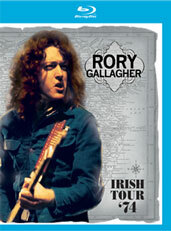 I nearly turned down reviewing director Tony Palmer’s Rory Gallagher documentary “Irish Tour ’74” based on previous releases of drab looking and damaged prints. Eagle Rock Entertainment/Eagle Vision changes that all with their remarkable remaster, to be released on April 12, 2011. My review of the Blu-Ray edition can be read at PiercingMetal.com. A personal Rory memory is here.